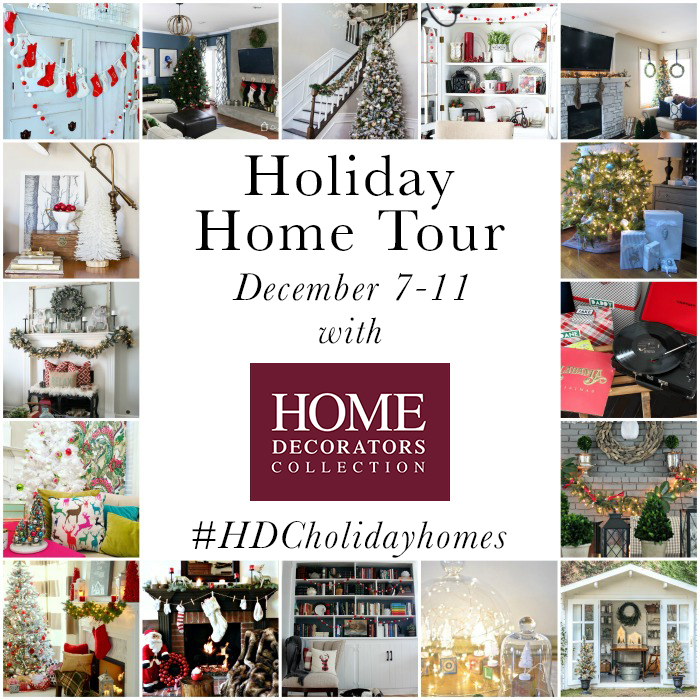 Holiday Home Tour Blog Hop & Home Decorators Collection Giveaway! HUGE thanks to Home Decorators Collection for sponsoring this post! The favorable opinions of the darling Christmas decor is all mine. Good morning! How was your weekend? Don’t you just love weekends in December? There always seems to be lots of fun things to do! Ours was busy scooting around Atlanta catching up with friends. I also decided that the only thing better than a lazy Saturday afternoon is a lazy Saturday afternoon in front of a Christmas tree. ‘Tis the season! Today’s post is pretty exciting y’all! I’ve teamed up with some of my favorite bloggers along with Home Decorators Collection to share lots of fun holiday home tours, plus the chance to win a $250 Home Decorators Collection gift card. (Be sure to enter the giveaway at the end of this post!) Home Decorators Collection generously allowed each of the participating bloggers to choose items to include in our home tours. I must admit, I kind of LOVE my new decor and can’t wait to show you how it looks in the dining room! If you missed any of the home tour last week, here is the foyer, family room and mantel. So let’s get started. With these Boxwood Topiaries! I have had Boxwood Topiaries on my wish list for YEARS. This set from Home Decorators Collection includes six various styles and sizes and did not disappoint! They look great staggered as a centerpiece on the dining table. I just used extra fabric leftover from the family room pillows to make a black and white buffalo check table runner. For the other two Topiaries, I gathered some silver urns and placed them on the mantel. I used to think that I needed specific decor items for each holiday. Hearts for Valentines, Bunnies for Easter, you get the drift. When it came to Christmas I immediately thought of Santa, reindeer, elves… you get the drift. Of course, I still love my Nutcracker collection and having holiday specific items to decorate with. However, over the past several years, I have found that I really love re-purposing decor that I have on hand for various holidays. This especially comes in handy when you don’t have a huge house, lots of storage…or lots of money for that matter! You can see here that I am using lots of every day elements here- my driftwood wreath, lanterns, metallics, the picnic basket, the pillow… and now- the Topiaries! I can’t think of any day of the year that these wouldn’t be a good idea. And they are perfect for the holidays! Of course, I still love adding some lovely Christmas decor so when I saw these Red Cardinals I immediately added them to my cart. Red Cardinals have pretty much become our “family bird” (is that a thing? you know, like a state bird?!?) because they were special to my Grandparents. Back when they had their farm house, they had a large red cardinal stained glass window . Now, every time I see a red cardinal I think of them. I love having a reminder of them around during the holidays. OK, now it’s time to see what every one else is up to on the Home Decorators Collection home tour- here is the lineup. You can also follow along on social media with hashtag #HDCholidayhomes. HOME DECORATORS COLLECTION GIFT CARD GIVEAWAY! TWO of our lucky readers will have the opportunity to win one of two $250 Home Decorators Collection gift cards! To enter, simply follow the instructions in the Rafflecopter widget below. The giveaway ends next Friday, December 18, at Midnight EST. Please see terms and conditions here. Your Christmas decor is gorgeous and I love those topiaries! It’s ironic that you mentioned thinking of your grandparents when you see a red cardinal. We lost my father in law this past March and he always liked red cardinals. Then this past summer my mother in law kept seeing cardinals and she would say to my sons, “Look there’s Papa watching over us.” Great giveaway and I LOVE Home Decorators! So beautiful! Love the topiaries and especially love the cardinals! (My college mascot! And we have had cardinals nests in our yard. We love them!) Your home looks so pretty. Everything is gorgeous, I love those topiaries! Love, love, love your topiaries! Looks so lovely Heather! I would put it toward a new rug! I really like the Sawyer area rug. I’m such a huge fan of your beautiful home. I love how you use what you already have to decorate-adding in the newer things makes old look new! So gorgeous! I love those topiaries too! have really done well with decorating your home. I also love Topiaries and have a few scattered around the house. Merry Christmas! I would love to have the Brunswick pendant lights. very inspiring, I really like the deer with the wreath around it, such a simple but adorable. its a cute mix of southern meets the holidays!! I really like the Madrid Club Chair and could really use that. I love the use of plaid. It is one of my favorite things around the holiday time.